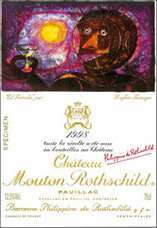 Composed of 86% Cabernet Sauvignon, 12% Merlot and 2% Cabernet Franc, the 1998 Mouton Rothschild is deep garnet-brick in color with lovely crème de cassis, dried roses, hoisin and baking spice notes with underlying notions of dried cherries and mulberries plus touches of wood smoke, incense and forest floor. Medium to full-bodied and packed with rich fruit framed by firm, chewy tannins, it is stacked with complex, evolving flavors and finishes with incredibly long-lasting perfumed notes. According to winemaker Philippe Dhalluin, this needs about three hours of decanting at this stage. I simply love the place this wine is in right now, possessing plenty of mature, tertiary characters yet still sporting bags of fruit. It won’t be fading anytime soon either and should cellar nicely for 20-25+ more years. Like many of its peers, the 1998 has filled out spectacularly. Now in the bottle, this opaque black/purple-colored offering has increased in stature, richness, and size. A blend of 86% Cabernet Sauvignon, 12% Merlot, and 2% Cabernet Franc (57% of the production was utilized), it is an extremely powerful, super-concentrated wine offering notes of roasted espresso, creme de cassis, smoke, new saddle leather, graphite, and licorice. It is massive, with awesome concentration, mouth-searing tannin levels, and a saturated flavor profile that grips the mouth with considerable intensity. This is a 50-year Mouton, but patience will be required as it will not be close to drinkability for at least a decade. Anticipated maturity: 2012-2050. Tasted at the Claret Club Mouton-Rothschild dinner. The 1998 Mouton has a very deep garnet hue. The nose has good intensity and fine definition with blackberry, cassis, graphite and a touch of sous-bois. The palate is tight at first...”a dense ball of Pauillac stubbornness” are the exact words that I wrote. But it unwinds nicely: graphite and cedar interlacing the black fruit, almost brutal towards the finish that needs more persistency. This will been another 4-5 years in bottle. Tasted November 2010.